I wrote this post initially for (in)courage: home for the heart of women. While many of you that read Balancing Beauty and Bedlam may not come from the same Christian world and life view, I think that challenging our teens to wrestle through hard topics and issues of all kinds is such a critical part of raising this next generation of world changers. I walked the stage, religion degree in hand, ready to love the youth of today. Having just spent four years focusing on what made teenagers tick, I was eager to dive into the world of youth ministry. The staggering statistics of Christian youth leaving the church puzzled me. I couldn’t wrap my brain around the fact that once teens left home, many walked away from their faith and never returned. Because imagining my life without Jesus? Empty. My heart ached; more than ached. I cried to the Lord for wisdom in mentoring this next generation of world changers. This generation who viewed truth as relative, desired more tolerance, and believed their faith not relevant to their everyday life. Single handedly, I wanted to love them to Jesus, to point them to the one true and living God, to open their eyes to God’s redemptive work in their lives and connect them to the transforming grace of Christ. Yet the more I tried, the harder I attempted to brainstorm creative ways to make ministry relevant, the more I sought understand their “feelings,” and address their new “needs,” the more conviction set my course — the truth of our historic, 2000-year-old gospel, which states unapologetically that our Savior, nailed to the cross for our sins and who rose again on the third day, doesn’t need to be made relevant for the sake of our youth. The gospel that shares the full impact of the law and our sin, the gospel that doesn’t dress up and repackage what happened at the foot of the Cross, but marries the impact of our sin, our need for a Savior, with the redemptive saving power of His ultimate sacrifice, is relevant today. 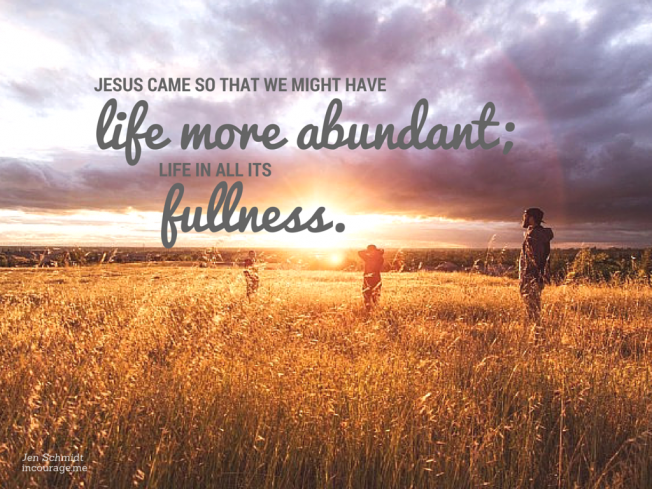 Jesus came so that we might have Life more abundant; Life in all its fullness. We don’t have to dismiss all logic and reason to have faith. It’s not a gospel for the non-thinkers. We don’t have to “change church” to keep people in the door. This isn’t about a building or a congregation, but about the saving knowledge of the One who paid it all. What happened 2,000 years ago is relevant today just as it is. We listen to the cries of society affirming that the church is a bunch of hypocrites, so we try and spit-shine the gospel, dumb it down, make it more tolerant, dress it up to entertain, and cast our nets wide so everyone catches a crumb. That doesn’t represent my Savior. Our children don’t need a self-help gospel, and I certainly don’t want to offer them a buffet of varying Christian thought which allows them to pick and choose what feels best because feelings change. My desire is that they develop critical thinking skills to wrestle through the dogma of the day. My desire is not to isolate or control, but to help arm them with a biblical worldview, deep-seeded in truths of the Gospel, so when their faith is tested, and it has been, they have an arsenal equipped to defend. We need to go deeper and dig into the meat of the Scripture. With our children now 21, 20, 18, 16, and 12, I’ve exchanged that simple prayer for the poignant reality of what it truly means to openly flush out the hard topics. It doesn’t come without pain and heartache. Raising children is hard. Raising teenagers is even harder, but raising teenagers/young adults with a Christian world and life view necessitates only what our Savior has to offer. Freedom comes from knowing that even the hardest curveball thrown can stand up to the authority of Scripture and who Christ is. In my next post, I’ll share what that powerful journey looked like with our eldest son: our deep thinker, our reader, our debater. He recommends that every person read C.S. Lewis’s Mere Christianity. Not just skim it or quote it, but study it, so I leave you with a discussion starter for your family time conversation. I’m passionate about iron sharpening iron, so I’d love to dialogue the topics with which you wrestle? Simple answers may be hard to come by, but sometimes just voicing them allows for growth.